Thanks to modern advancements in the field of dentistry, a variety of procedures are now easier and more comfortable than ever. Smileboston Cosmetic and Implant Dentistry, an industry leader in dental innovation and technology, uses the Waterlase® dental laser to greatly improve the patient experience. Here are just some of the benefits laser dentistry offers. Typically, manipulating teeth is a cumbersome and potentially uncomfortable process. Unlike traditional dental drills, the Waterlase dental laser uses a high-powered laser to cut through teeth, gum tissue, and bone effortlessly. Not only is it more precise than other dental tools, it can often be used as a quick and painless replacement of a dental drill. The laser can be used to complete fillings, define gums, place implants, treat cold sores, and even perform root canals. 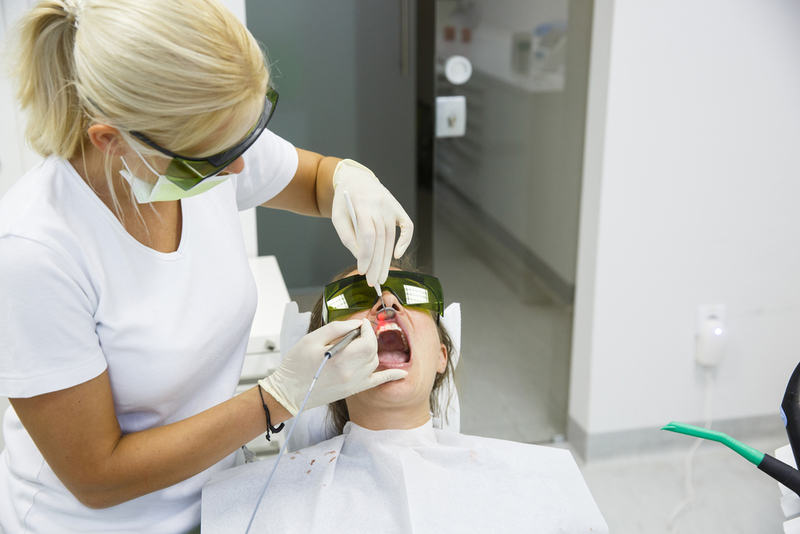 While previous procedures may have caused significant pain and anxiety, laser dentistry is much less invasive and requires fewer shots, stitches and anesthesia. Patients report minimal discomfort and inflammation during and after procedures. A typical dental drill causes pain due to the vibration, heat, and pressure. Because a dental laser doesn’t generate any of these, patients have a more comfortable experience and heal much quicker. As a result, patients who suffer from dental anxiety often find that laser dentistry makes the experience more relaxing and pain-free. If you have been searching for an easier, more comfortable dental experience, look no further than Smileboston Cosmetic and Implant Dentistry. With two beautiful offices in the Boston area, we offer a full array of services ranging from general dentistry to full smile makeovers. To schedule an appointment at our Brookline location, call (617) 277-4100 or (781) 826-7577 for our South Shore location. For more information, please visit Smileboston online.